Cooking is one of the basic skill I'm still in the progress of learning and hopefully to master in the future. As a housewife and a mother, it is important to me not only to cook delicious and nutritious meal but I make sure of ingredients that I use. 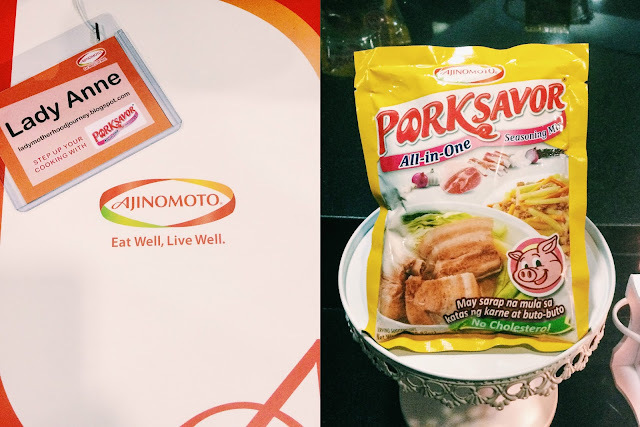 So when I got an invite from Ajinomoto for the launch of PORKSAVOR, I am so excited because our family are fan of Ajinomoto products since then. True to the activity entitled “Step Up Your Cooking with PORKSAVOR®”, Ms. Nancy Reyes-Lumen (a TV Personality, Co-Author of Malunggay Book, known as Adobo Queen and popularized the word Pinoy Umami) and the brand ambassadors conducted live cooking demonstrations in a bid to challenge homemakers to step up their cooking and bring out the meaty goodness of home-cooked dishes using PORKSAVOR®. The show kitchen of the Center for Culinary Arts was filled with the delicious meaty aroma of dishes cooked for the audience. The most important tip Ms. Nancy Lumen-Reyes shared was when we are transporting a pack of food, leave a space at the center because bacteria starts there especially dense foods like pancit and macaroni salad. Kaya pala ang bilis mapanis ng pansit. Now we know! Ms. Nancy Lumen-Reyes and brand ambassadors Mrs. Bambi Gil and Enrique Gil cooking Pastel. PORKSAVOR® can provide the meaty taste in dishes even without meat. Using PORKSAVOR®, Ms. Nancy Reyes-Lumen cooked meatless pancit, which makes a great high fiber snack for those limiting their cholesterol intake. Mrs. Bambi Gil, who knows her way around the kitchen, also helped prepare the PORKSAVOR® Veggie Soup and Pastel dishes. Both recipes are a step up from the usual ‘pambaon’ ideas and are likewise perfect for the rainy season. 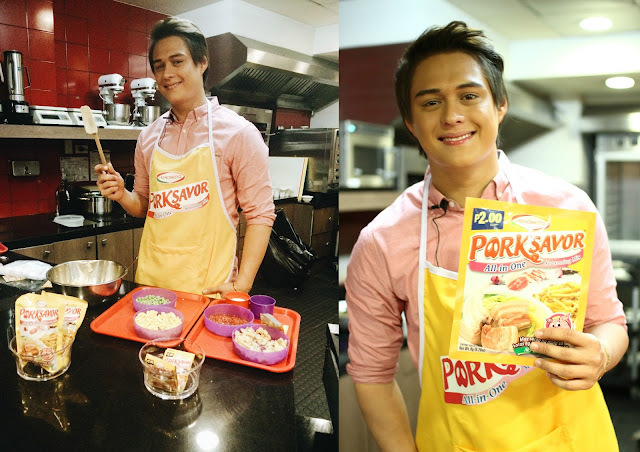 The mother and son tandem of Bambi and Enrique Gil are thrilled to endorse a one-of-a-kind product like PORKSAVOR®. While taping for the commercial, Enrique was fascinated with the burst of meatiness as he sampled food cooked with PORKSAVOR®. Mommy Bambi loves to cook for her 3 children, and PORKSAVOR® can help her put in the effort to make meal times truly enjoyable for the whole family. PORKSAVOR® was launched June 2014 and because of a certain enjoyment of Filipino household for eating pork, this product was made. It uses real pork meat extracts which guarantee to have quality standard and product. The function of PORKSAVOR® is to enhance overall taste with it's general meaty flavor and can apply to many dishes. It comes in 2 sizes, 8 grams for P2.00 and P250 grams for P54.00. I really enjoyed the live cooking demo. I didn't expect that Ms. Nancy is very amusing and entertaining. Her sense of humor lighted the whole place. Mrs. Bambi, is a mother goal and inspiration for me and Enrique Gil is very natural and bubbly person. If you would like to have the recipes, you can download it here. Have seen Enrique for the first time and he seemed decent and nice. I also like his onscreen partner. Sana I get to see them both in Ajinomoto's next events. I tried using pork savor at home and the boys and even my mom loved the dish. The meaty taste was there though I didnt put any meet. On out next grocery trip, i plan to include pork savor in our list. I don't remember the last time we used flavouring in our dishes - may dad has poor kidneys kasi. But when eating outside, I still prefer strongly flavoured meals haha! Oh Hi Enrique! Hahaha..i love watching cooking demos, i dont know why, I have a thing for it. Haha. and yes we use pork savor at home. I use pork savor for my cottage pie. I miss making it na nga. This post reminded me of it. Teka..leave a space at the center to leave the bacteria out? Great tip! Will remember that. Hi, Mommy Lady Anne! Thank you for sharing. Would you know the difference between PORKSAVOR and MSG? But I've long since turned my back on seasonings like this and Magic Sarap. :( But interesting trivia on the pansit and why it's easily spoiled. Aw! This is one of the events that I really hated myself for being late, di tuloy kami natuloy. Nakita ko sana si Tenten. I haven't tried pork savor yet but it sounds like a nice seasoning. I'll try it next time.